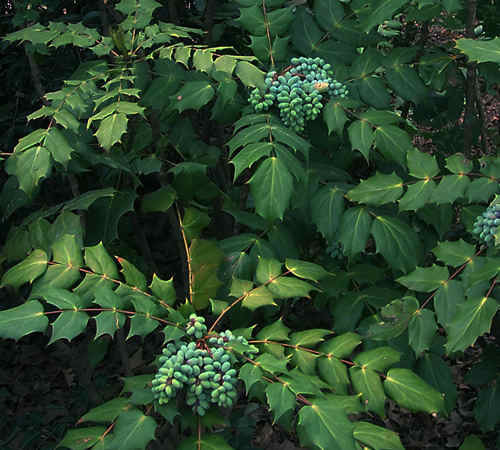 Leatherleaf Mahonia - Interesting shade accent. 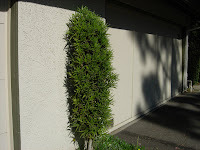 Distinctive spiky foliage. Blue berries and yellow flowers in season. 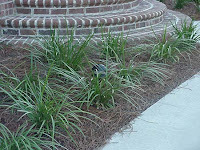 Liriope, Big Blue - Good, basic groundcover. 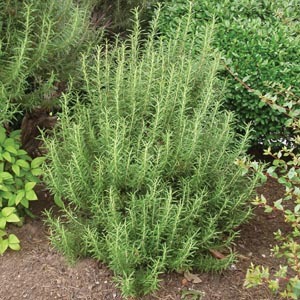 Does well in sun or shade. Blue flower spikes in summer. 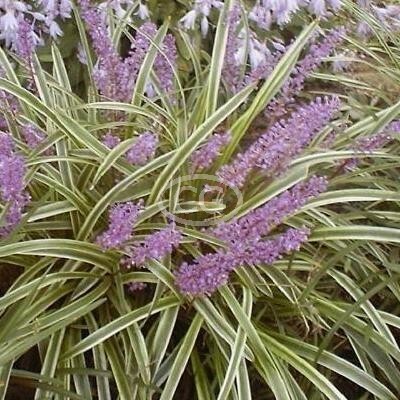 Liriope, Giant - Ornamental grass. Large, dark green blades. Good as an accent plant. 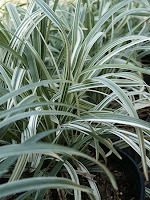 Liriope, Silver Dragon - Ornamental grass with whitish-silver highlights. 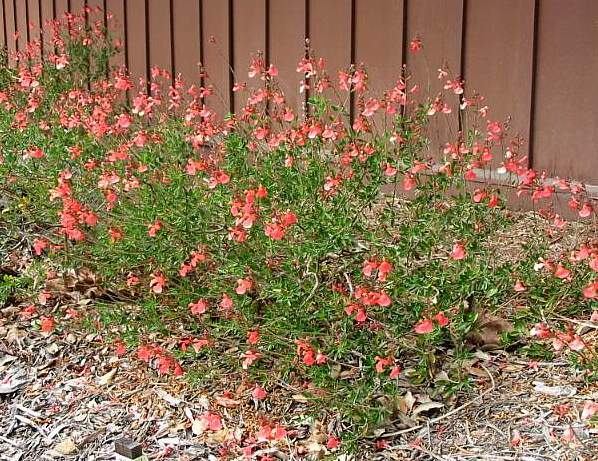 Great change of pace as a border or groundcover. 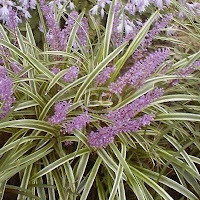 Liriope, Variegated - Groundcover grass with yellow highlights on blades. 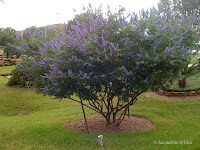 Purple flower spikes in summer. Little Gem Magnolia - Ornamental tree with large, dark green leaves. 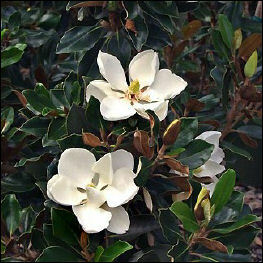 Large white blooms in spring and summer. 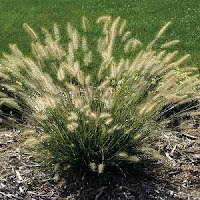 Miscanthis - One of many varieties of ornamental grass. Wispy seed heads on a short, full clump of grass. 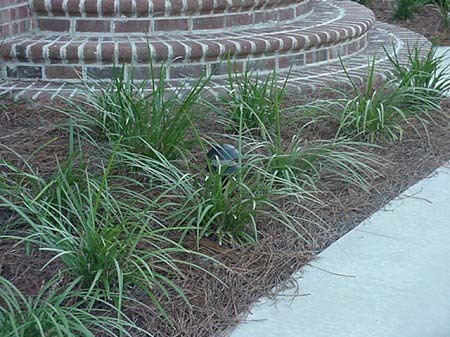 Mondo Grass - Fine, dark green ground cover. Can handle some sun but prefers mostly shade. 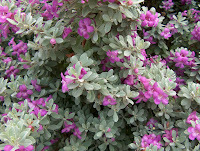 Good for use in deep shade areas with no grass. 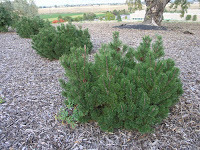 Dwarf variety is available too and looks good between flagstone. Mugo Pine - Short, compact pine with a rounded growth pattern. Looks good with boulders. 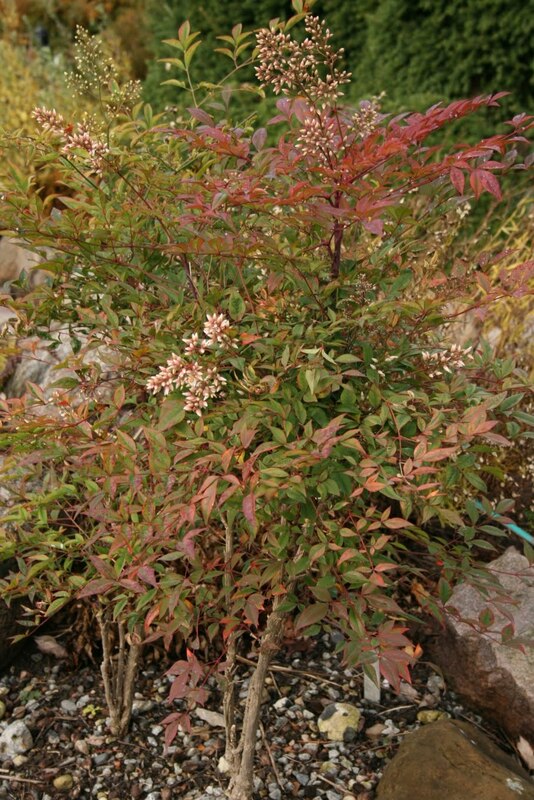 Nana Nandina - Compact Nandina. Generally stays in a globe shape. Yellow and red highlights. Nandina Compacta - Most common Nandina. Fairly short and compact. 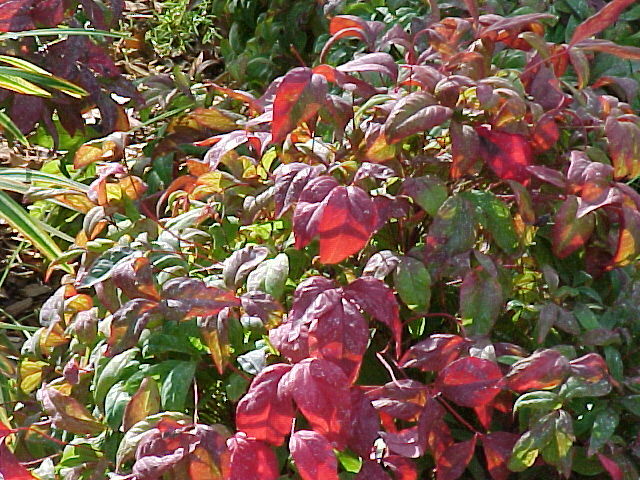 Highlights are mostly red, especially in winter. Nandina Domestica - Tall, bamboo-looking Nandina. Open branching with red / orange / yellow highlights. 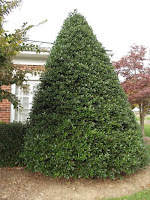 Nellie R Stevens Holly - Large, cone-shaped holly with dark green leaves. Oleander - Large, tropical looking shrub. 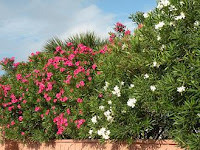 Bright red, pink or white blooms spring and summer. 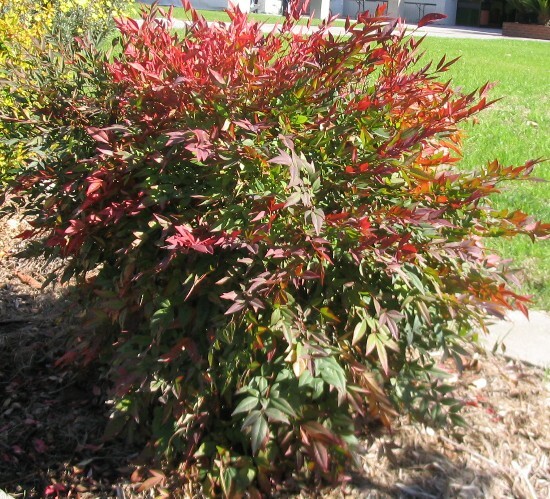 Photenia (Red Tip) - Large shrub with bright red accents. 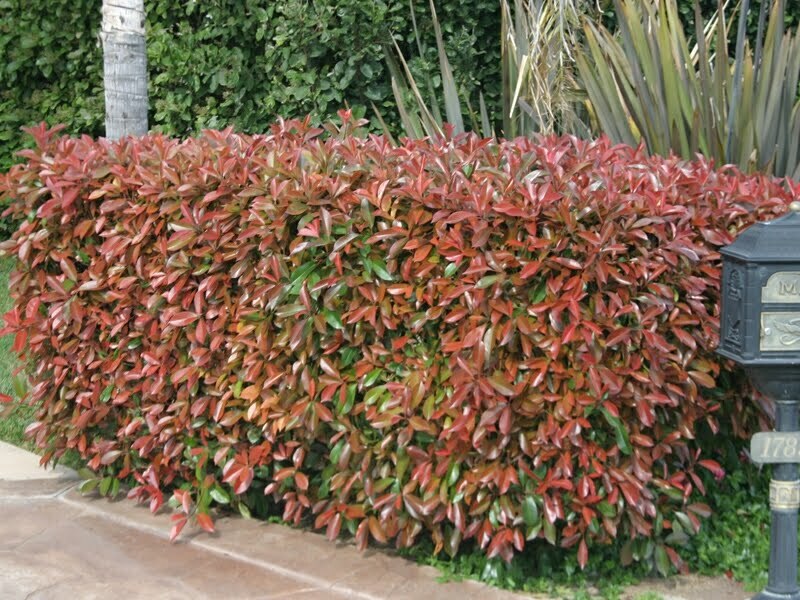 Can be maintained in a hedge. Can grow tall for use as a screen or background. Pittisporum - Low growing shrub with a natural rounded shape. 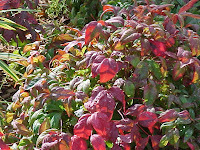 Variegated varieties have white or yellow accents. Podocarpus - Upright, narrow evergreen. 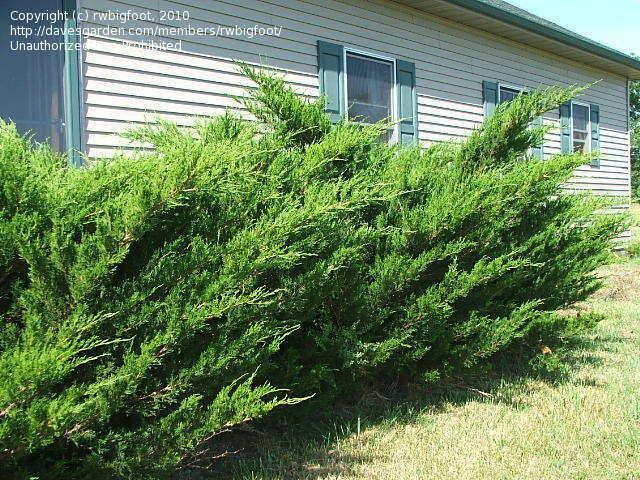 Good plant to add some height in a tight spot. Prefers some shade. 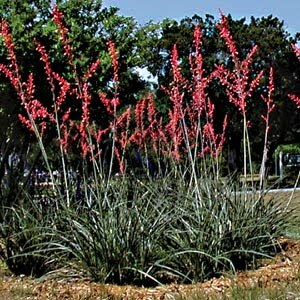 Red Yucca - Desert plant with tall summer flower spikes. Low water needs. 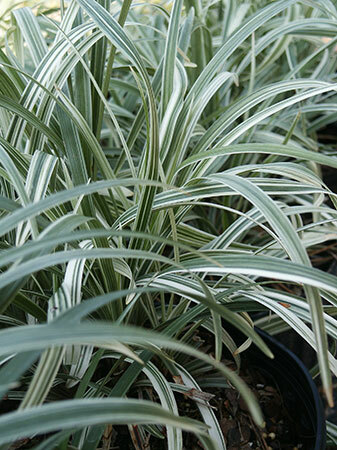 Interesting gray-green foliage. Rosemary - Small, fragrant accent plant with year-round wispy foliage. Light blue summer blooms. 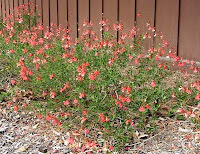 Salvia Greggii - Also known as Autumn Sage. 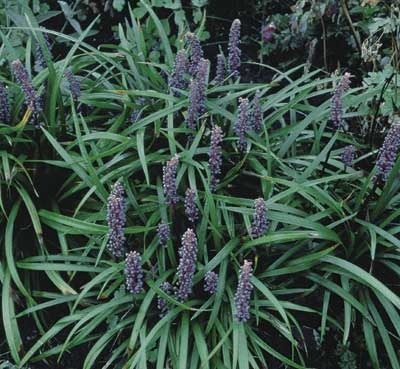 Long blooming perennial. 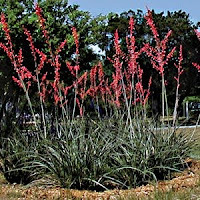 Covered with spikes of bright blooms in red, pink, or salmon. Dies back in winter. 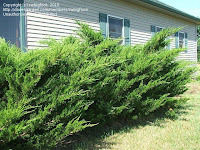 Sea Green Juniper - Large evergreen shrub. Low water needs once established. Good screen or background plant. Texas Sage (Silverado) - Native shrub with bright silver foliage. Drought resistant. Purple summer flowers. 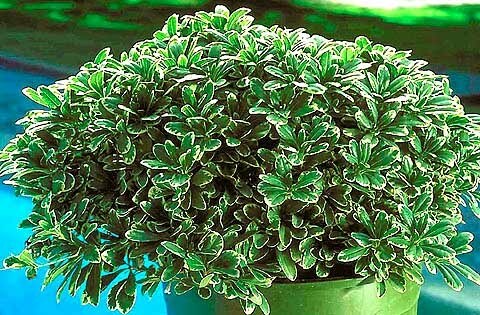 Green Cloud variety has dusky green foliage and a tighter growth pattern. 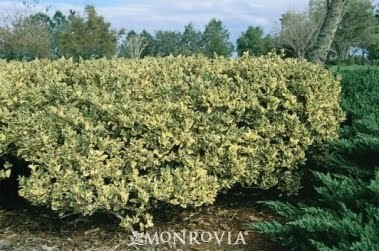 Variegated Privet - Large, fast-growing shrub with yellow and green leaves. 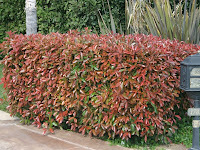 Can be pruned into a hedge or rounded. Vitex - Native ornamental tree. Drought resistant. 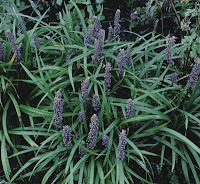 Purple flower spikes in summer. 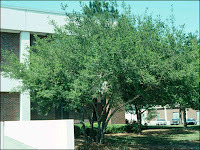 Yaupon Holly - Ornamental tree. Small green leaves with a nice natural shape. Does not drop leaves.